The second DLC pack for Call of Duty: WWII is now available, taking players to historic Dunkirk, to Egypt, and even up into the sky for some aerial dogfighting—a first for the Call of Duty series, believe it or not. “The War Machine” arrived on April 10 for PlayStation 4, and the new content brings a little more variety and spice to WWII. Xbox One and PC players should expect the DLC to be available a month from now. War Machine includes three standard multiplayer maps, one War multiplayer map, and a continuation of Sledgehammer Games’ Zombies storyline. Overall, it adds some much-needed extra flavor to Call of Duty: WWII. The introduction of aerial combat in multiplayer, the beautiful design of Egypt, and the challenging nature of the new Zombies map are definitely the highlights of this second map pack. But let’s take a look at all the new features in turn. Dunkirk is set on a boardwalk beachfront locale in the French city. There’s open beach ground for sniping and mid-range combat on one half, while the opposite half gives close-quarter fighting in building interiors with a layout similar to Modern Warfare’s Bog. The map does feel much smaller than it appears, and WWII really could’ve used more large maps, but I think Dunkirk still plays really well with the split design. V2 is a rocket testing site in Germany, bringing intense, close-quarters gun fights. V2 is small and ridiculously chaotic, so this is definitely the map where you want to equip a shotgun or submachine gun. The center rocket is where a lot of the action lives, but I also found the design a bit frustrating with several scalable platforms stacked on top of each other. I often found enemy players dropping down on me, or sometimes I was just awkwardly falling onto a level below. There’s even a deadly-red-button-of-death at the top of rocket that you can press to burn and kill players lurking below you, which totally sounds like fun until it’s used against you. V2 is definitely a map you’ll either love or loathe. 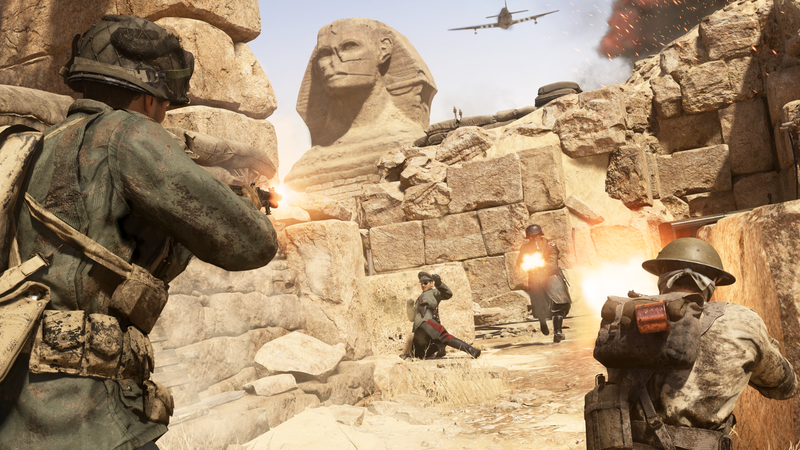 Egypt brings Call of Duty multiplayer to an unexpected World War II battlefield with pyramids in the ancient ruins of Giza. This is a pretty well balanced map, and the layout works well for various objective modes. There’s a lot of tunnels and flank routes, but there’s a great amount of open area outside as well. The warm feel of Egypt is also a refreshing change to WWII’s otherwise grim and gritty map selection. This is by far my favorite multiplayer map in this second DLC pack. Operation Husky takes inspiration from the real Allied invasion of Sicily in 1943, and the map also introduces the first ever aerial fighting sequence to Call of Duty multiplayer. Allied forces must retrieve and transmit intel before taking to the skies in fighter planes. The opposing Axis forces must prevent the retrieval of the intel, but if they can’t, they’ll find themselves in the cockpit of a fighter plane for some fast-paced dogfighting. The addition of aerial fighting in Call of Duty multiplayer is quite a surprise, spicing up the final objective in this team-based mode. The controls feel great for aerial movement, but the combat is rather simple. Each team has a set amount of lives, and the object is to shoot all of their planes out of the sky until they run out of respawns. It’s basically a limited Team Deathmatch in the sky. The aerial portion also contains killstreaks consisting of flak guns and assisted fighter pilots, but I haven’t been quite a skilled enough pilot to earn them. It only takes three kills to earn a streak, but the planes don’t have health regeneration like your soldier has in core gameplay, so I haven’t successfully shot more than two planes before being blasted from the sky. The combat zone is a pretty limited size as well, so don’t expect any Battlefield 1 caliber of aerial fighting, but I still enjoyed the flying sequence for what it was. In the Zombies “Shadowed Throne” DLC, the four playable characters now find themselves in the burning streets of Berlin, where the undead are snacking on soldiers and citizens. This Zombies map actually shows human NPCs getting mauled by the monsters, so this is a new touch to the haunting atmosphere. I’ve tried to save the NPCs, but I arrived a little too late each time. I’m honestly not sure if you can save them, or if they serve some other purpose. I am enjoying the map so far, but I am a little disappointed that we still haven’t seen the arrival of Zombies Orders. Much like the Orders you can complete in multiplayer, the addition of the challenges and rewards would add to WWII‘s Zombies lack of replay value. A section of the Zombies menu still holds a place for Orders, but the option is still greyed out for now.